heavy metals are seeping into Kolkata's groundwater from Dhapa, its waste dumping ground on the eastern fringe of the city. A study has found traces of chromium, zinc, cadmium and copper in areas around Dhapa. Copper and cadmium above permissible limits was also recorded. Under pressure are the East Calcutta Wetlands (ecw), the city's natural and the only sewage treatment system, located near Dhapa. 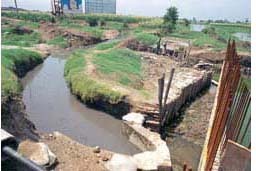 "Sewage of the entire city collects at ecw along with industrial waste from tanneries, battery and jewellery factories. These wastes contain heavy metals whose load is so high that the wetlands can't filter all of it," says hydrogeologist P K Sikdar of the Indian Institute of Social Welfare and Business Management, Kolkata. Polluted water is permeating the aquifer through a number of deep-buried paleochannels (underground channels carved out by once-active streams and rivers). These have cut into the confining layer of the aquifer under Dhapa and ecw. The aquifer lies under an approximately 40-metre deep layer of clay in this region, from where groundwater is extracted. Crisis in the offing Half a century ago, when Kolkata's groundwater flow was from north to south and the ecw wasn't under threat, this wouldn't have posed much of a problem. However, due to massive extraction of groundwater within the city limits in recent years, a large trough has developed under central Kolkata. Water from all directions, including groundwater from dhapa and ecw is collecting in this trough. Experts believe the city could be facing a crisis within a few decades if nothing is done to clean up the water. The only respite, for now, is groundwater flows slowly so it will take a long time, maybe several decades, for the pollutants to spread, says Sikdar. Measures to reduce stress on the aquifer and ecw need to be taken now. "We have to be very cautious about how and at what rate we use groundwater," says Sikdar. Construction of highrises should be banned, he says. They use up a lot of groundwater because they usually don't get surface water supply. Use of surface water should be increased and the aquifer needs to be recharged through rainwater harvesting. Hydrogeological simulation analysis allows evaluation of the impact on past,present and future pumping for the region of Kolkata on recharge area locations in an aquifer that supplies water to over 15 million residents. The study highlights the impacts of pumping on water sources for long term development of stressed city aquifers and for future water supply in deltaic regions of the world.